Adidas have found a new, and fun way to tease us with a forthcoming colourway  by using the new, social service, Vine. Here you can upload small short sequence videos, and that is exactly what Adidas have done. Here they reveal a brand new colourway of the F50 Adizero. Find out more about it here. After the launch in November, it is time for new colourway, to join the current colours in Adidas' popular F50 Adizero collection, and now Adidas have given us a little sneak-peak at next colour of the speed boot. They have been at a photoshoot with Bastian Schweinsteiger, who looks to have completed his switch to Adizero  and from here Adidas have a couple of short videos via Vine. Here you can see Schweinsteiger sitting at Allianz Arena, where he in the dressing room, and at the staircase, can be seen juggling a ball around (Why he feels the urge to kick it against the wall, is so far still beyond us...) in his new boots  and the question is; when will we see more of the Blue/White Adizero? Bastian Schweinsteiger has for long time been a constant user of the AdiPURE-collection, but before that range was released, he was actually a F50-player  and now it would seem, that Adidas have gotten the German midfield maestro back in the F50 boots. 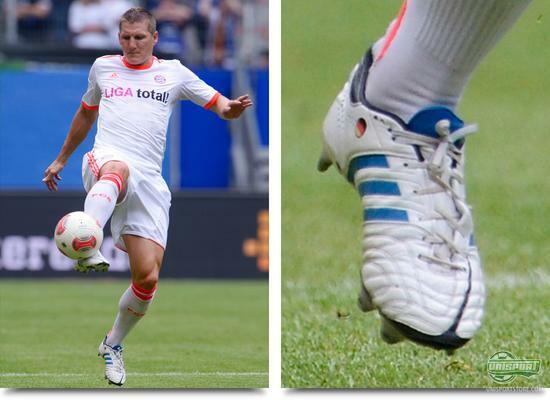 Schweinsteiger played for a long time in his AdiPURE III, that he kept a hold off through thick and thin,  Adidas even made personal custom boots for him, that gave him his beloved AdiPURE III, with the new boots in the collections design. This is just a saga now, and we will therefore probably see Schweini command Bayerns midfield in the Adizeros leather model. What do you say to the new colour of Adizero? Is it cooler, than the previously released colours? Does it fit Schweinsteiger? Feel free to share your thoughts on the boot, Adidas' new way of launching a boot, and Schweinsteigers boot change down below.